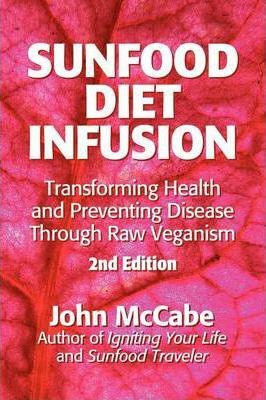 John McCabe is the author of Sunfood Living: Resource Guide for Global Health, Sunfood Traveler: Guide to Raw Food Culture, and Igniting Your Life: Pathways to the Zenith of Health and Success. He has been a ghost co-author on other popular books about raw food. In this book McCabe covers a variety of issues to explain why so many people are turning to a diet consisting of raw, organic fruits, vegetables, sprouts, nuts, seeds, and sea vegetables. Sunfood Diet Infusion details a variety of reasons why a diet that is vegan and all – or nearly all – raw is vastly more healthful than what has become the Standard American Diet (“SAD diet”) of processed, chemical-laden, nutrient-deficient, disease-inducing, plasticized, mass-marketed corporate foods. Topics covered include the environmentally ruinous meat and dairy industries; the toxicity of farming chemicals; the benefits of organic gardening and locally-grown foods; the growing interest in permaculture; whole body nutrition; disease reversal; brain plasticity; maintaining vibrancy; the myths and truths of veganism; and the strong connection between global health and humanity’s food choices. A helpful kitchen set-up and sample recipe section completes the book. McCabe’s books are collectively a revelation from someone told twenty years ago that he would die from kidney failure if he didn’t undergo a transplant, and that he would never be physically active without undergoing back surgery to fuse several vertebra and implant iron rods along his spine. Defying doctors, McCabe instead transformed his health through exercise and changing his diet to one free of animal protein and fried foods, but one that is rich in fruits and vegetables. The Sunfood Diet is not about measuring foods, counting calories, meal plans, or processed and packaged diet foods. Instead, it is abundant in natural, vibrant foods that infuse health: fresh, organic produce. At a time when diabetes, obesity, and heart disease are rampant in modern society, and when most people get their nutrition education from corporate food commercials, this book offers a refresher course in why truly healthful food really is important – for people, wildlife, and the environment. If you desire to experience truly vibrant health, read this book.